– 7th March British University Championships – This is a large student event taking place on the main slope. The site will be busy and we do advise booking in advance. More details on upcoming events can be found on the Snozone website https://www.snozoneuk.com/slope-events/ or in the events section of the Snozone page on Facebook. For freestyle park plans please see https://www.snozoneuk.com/park-plans-milton-keynes/ for Milton Keynes or https://www.snozoneuk.com/park-plans-castleford/ for Castleford. 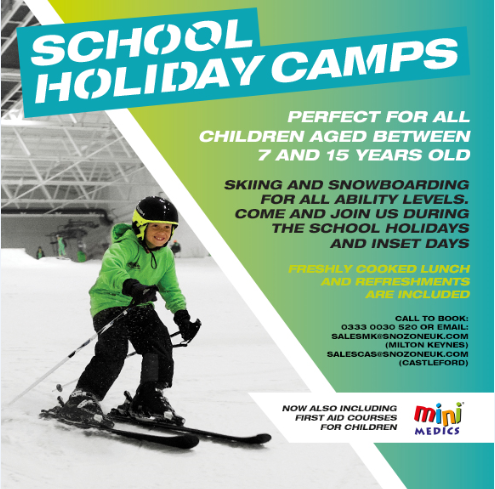 If you live near to Basingstoke, visit Skizone to learn as an individual or as a family, or for an intense ski or snowboard workout! Check out the Skizone website here. Previous Previous post: Train like an Olympian!